You’ve heard about Loan Ranger, Moola, and Tala Philippines so many times. Some had good experience while there are others who decided to look for other online cash providers. If you are one of them, you might want to consider Cashwagon. Who is Cashwagon? Cashwagon is a Philippine-based company that offers financial technology solutions through online consumer financing. They offer online cash loan with no collateral requirements and complex paperwork to help every Filipino address their growing daily needs. Using cutting edge technology, Cashwagon commits to easy application access and 24-hour fast disbursement process. In relation to this, Cashwagon charges service fee (depends on the tenure of the loan) and processing fee, which is reportedly higher compared to its counterparts. Visit Cashwagon website. On the landing page, you will see a loan calculator that you can navigate. Choose the amount you want to borrow. Take note that for first time customers, you can only borrow for a maximum of P7,000. If you are a returning borrower, you can get as much as P18,000. Set the loan term. You can choose among 10, 20, or 30 days (which is the maximum). You will immediately see your Payment Due Date and Total Repayment. Cashwagon representative will contact you through email and text message to inform you the status of your loan application. You will also receive instructions on how to get your cash deposited in your bank account. Per website, standard waiting time is 30 minutes from the time the application was submitted. If approved, you will receive your money in your bank account within 24 hours. You will also receive a text message informing you about the cash transfer as well as a Loan Contract sent to the email address you indicated. Make sure you are between 22 and 60 years old, employed, and with steady source of income. Prepare personal information details as well as bank details where the money will be credited. You may apply for a succeeding loan, as long as you were able to pay your previous loan on time and in good credit standing. Can I apply for a loan for P5,000.00? I am self employed, operating small Piso Net and an X-box for games Shop. I am also a house and lot sales agent with an allowance of P12,000.oo/month and a dealer of Green Varley a product of Health Wealth International Corp., USA. Hi Antonio! Please visit Cashwagon website (https://cashwagon.ph/) if you’re interested in applying for a cash loan with them. Thanks! I just got an sms yesterday that im approved for my cashloan and adviced me to check my email from time to time but im not recieving anyone yet, im still waiting for the money to be deposited in my account..
Hi Dennis! Please contact Cashwagon directly regarding this at (02) 672 7853 or send them an email at [email protected] Salamat! Hi Ivy! 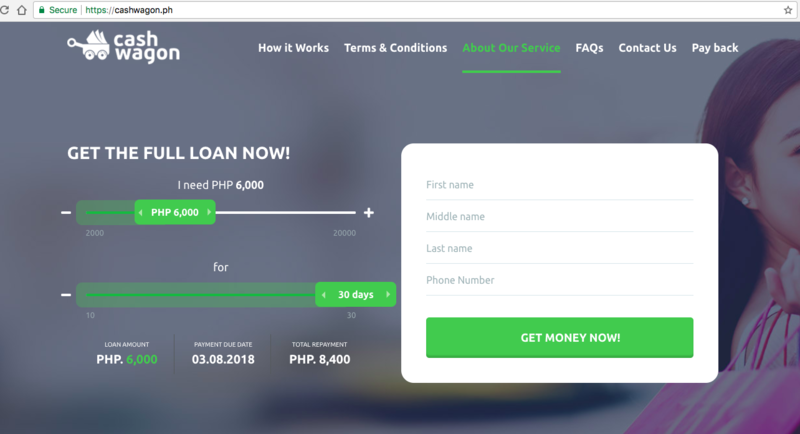 We indicated the steps on how to apply on this post 🙂 You can slo visit their website (https://cashwagon.ph/) so you can apply for a loan with them. Thanks! Do you know something about Robocash? Hi Juana! We haven’t heard about Robocash yet. WIll look into it and make a post about it soon. Thanks!